Manufacturer and Exporters of Centralised Lubrication Systems, Drip Feed Oilers, Lubrication Pumps, Motorised Lubrication Pumps and Hand Operated Grease Lubricators. 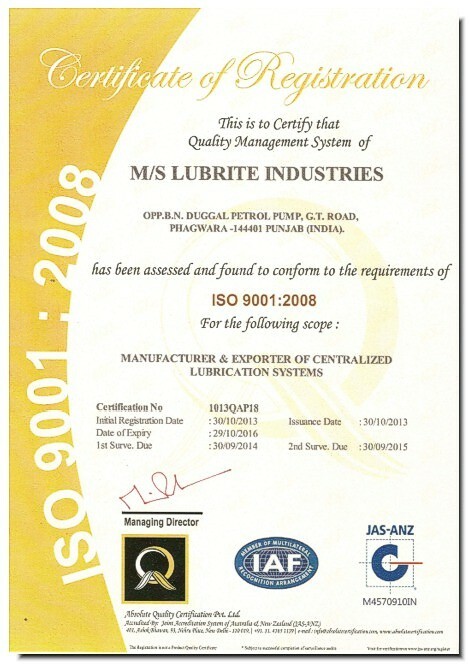 Lubrite Industries is among the pioneers in India in manufacturing and exporting Centralised Lubrication Systems, Drip Feed Oilers, Multi-point Lubrication Systems, Dual Line Lubrication Systems, Automatic Lubrication Units, Deluxe Automatic Lubrication Units, Timing Devices, Hand Operated Single Shots and Pneumatic Single Shots. We manufacture a complete range of Lubrication Pumps and Lubrication Systems to keep your machines running trouble free. Established in 1975, Lubrite Industries is an ISO 9001:2008 certified company located at Phagwara in Punjab, and is outfitted with branded indigenous as well as specially imported machines. Our brand Lubrite is spreading across the globe. Lubrication Systems and other Products manufactured at our highly advanced manufacturing plant are meant for a variety of industrial verticals like machine tools, rubber processing industries, sugar mills, paper mills, cement plants, pharmaceutical industries, coal mines and other uses. Our vast infrastructure coupled with consistent quality maintenance efforts enables us to bring superb quality products to our customers at the possible best rates. To take it a bit further, Lubrite Industries also manufacture Customised Centralised Lubrication Systems and comprehensive Lubrication Solutions for the global clients. Just let us know your lubrication requirements, we will design and develop a complete Lubrication Solution as per your specifications. Our lubrication systems are acknowledged for both top of the line reliability and affordability. Lubrite Industries has an impressive product-line consist of world-class Centralised Lubrication Systems, Lubrication Pumps, Drip Feed Oilers, Rotary Pumps, Hand Operated Lubrication Pumps, Progressive Blocks to address your anytype of Lubrication requirements. LUBRITE undertakes to remain as a symbol of best quality and state of art technology. Satisfaction is guaranteed to our esteemed customers through best quality control and timely deliveries. 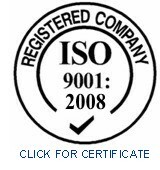 Our top quality is recognised all over the globe.